Sofitel Centara Grand Bangkok and Bangkok Convention Centre are conveniently located adjoining the new expressway just 10 minutes from the airport and 15 minutes from the centre of Bangkok. Each of the 607 deluxe rooms and suites at Sofitel Centara Grand Bangkok offers a panoramic view of the city’s skyline. 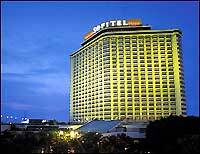 The first hotel to operate under the Sofitel name in Asia "City of Angels", guest will discover that there is very little reason to leave the Sofitel Centara Grand Bangkok once settled in. An international deluxe business hotel that emphasis efficiency, charm and elegance. Take residence in one of the 607 superb rooms or suites, each tastefully designed for comfort and convenience. The outdoor Swimming Pool is surrounded by lush, tropical gardens, an oasis of peace and tranquility. The Fitness Centre offers an inspiring environment for an invigorating work-out on state of-the-art equipment, with separate saunas and Jacuzzis. Enjoy an unsurpassed Thai approach to easing stress, relaxing one’s mind and renewing one’s energy by facial and body treatments in our Centara Spa. Don Giovanni Italian; Our Italian master chef prepares specials for lunch and dinner. Here the pasta is homemade, the sauces are wonderfully Italian, and the pizzas are baked in an authentic charcoal oven. Opening Hours:11:30 - 14:30 hrs. / 18:00 - 22:30 hrs. Dynasty Classic Cantonese; This elegant restaurant conjures up appetizing wonders of lmperial China, including a wide selection of delectable Dim Sum at lunchtime. Le Danang Vietnamese; Authentic cuisine in Bangkok�s best-known and award-winning Vietnamese restaurant, with numerous exotic dishes which emphasize the natural goodness and nutritional value of Vietnamese food. Hagi Japanese; Food from the �Land of the Rising Sun�. Savour a teppanyaki or any of the more than 50 authentic dishes on our traditional menu, in an atmosphere reminiscent of Japan. Opening hours: 11:30 - 14:30 hrs. / 18:00 - 22:30 hrs. Suan Bua Thai; Popular Thai, BBQ & Seafood Suan Bua is dedicated to offering authentic Thai cuisine and fresh seafood and meat barbecues. Chatuchak Cafe International (Buffet or A La Carte); The coffee shop offers 24-hour service, with a menu that highlights International and Asian favourites, served in casual and comfortable surroundings. Cappuccino Corner Coffee, Tea and Baked Goods; A delightfully cozy nook where one can leisurely indulge in the engaging aroma of coffee or as well as a selection of cakes and pastries. Opening hours: 06:30 - 22:00 hrs. Coco's Coffee, Tea and Baked Goods; Coco�s offers a wide range of cakes, cookies, chocolates and pralines to accompany a cup of freshly brewed coffee or tea. Opening hours: 8:00 - 20:30 hrs. Gio's Coffee, Tea and Baked Goods; Gio�s, the perfect spot to watch the World go spinning by while lingering on a creamy Cappuccino, or a perky Espresso. Lobby Lounge Drinks over Live Music; After a hectic day of business or sightseeing and shopping, the Lobby Lounge is the perfect venue for relaxing over cool cocktails, with our resident musicians. Opening Hours: 09:00 - 01:00 hrs. CENCIO Karaoke; Enjoy a Karaoke experience in one of our 18 private rooms for groups of 5 to 20 guests; while the communal bar area comfortably seats up to 40 people. Opening hours:11:30 - 16:00 hrs. / 17:00 - 2:00 hrs.